Joyce A. Fitch, 93, of Berrien Springs, passed away at her home on Tuesday, Jan. 15, 2019. Services will be held at a later date. Following cremation, her ashes will be returned to Rose Hill Cemetery, Berrien Springs. Allred Funeral Home is assisting the family. Online messages may be left at www.allredfuneralhome.com. Joyce was born April 14, 1925, in Big Rapids, Mich., to Ray and Anna (Kemstra) Brassington of Rodney, Mich. She came from a large family of eight brothers and sisters. She lived her entire life in Michigan and attended grade school in Shelby, Cedar Lake Academy in Edmore, and Andrews University in Berrien Springs. She received her teaching degree from Western Michigan University, Kalamazoo. She married Charles H. Fitch of Chicago on Sept. 7, 1947, and Berrien Springs is where they lived the rest of their lives together. 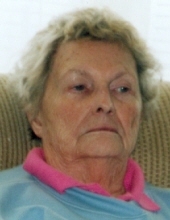 Joyce was a Michigan school teacher all of her adult life until retirement. She began teaching in rural one-room country schools, including Landon, Hand, Hill, and Fairland. She then moved to the Coloma School District where she taught elementary for several years. She retired after teaching for 12 years at Mars Elementary in Berrien Springs. Joyce and Charles had a wonderful life together, with summers off enjoying traveling and their summer cottage at the lake. She enjoyed her retirement years antiquing and setting up a store in an antique mall. She is survived by her son, Gregory Fitch of Berrien Springs; one sister, Esther Nelson of Tipton, Ind. ; and many nieces and nephews. She was a wonderful person who will be missed by all. To send flowers or a remembrance gift to the family of Joyce Arlene Fitch, please visit our Tribute Store. "Email Address" would like to share the life celebration of Joyce Arlene Fitch. Click on the "link" to go to share a favorite memory or leave a condolence message for the family.